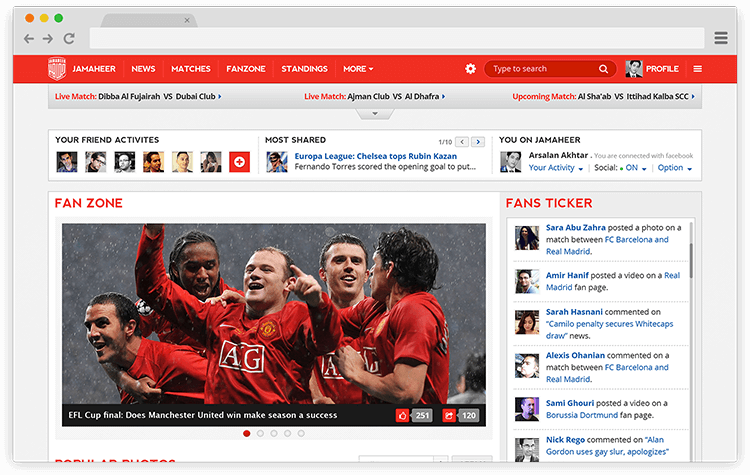 Jamaheer is a sports portal with a large focus on football. 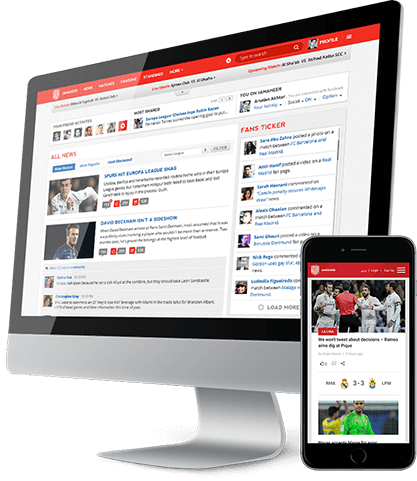 With mobile responsive design and multilingual support, it caters to a massive audience and is the premier football portal in the middle east. 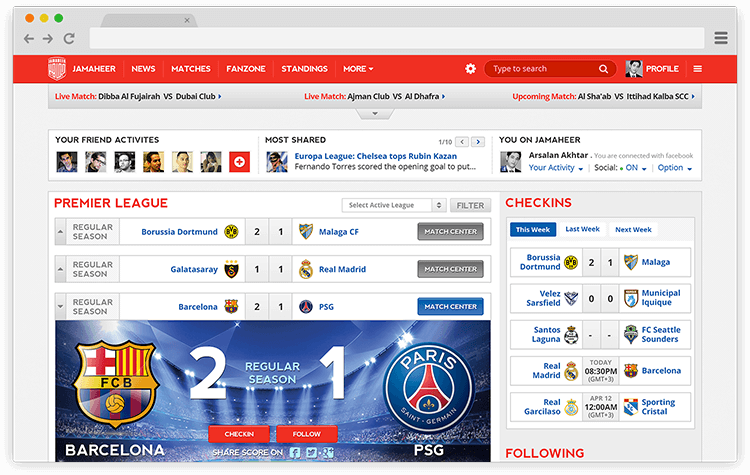 Along with the latest news & results, it also consists of social integration and gamification elements such as match predictions and fan zone activities, to name just a few. 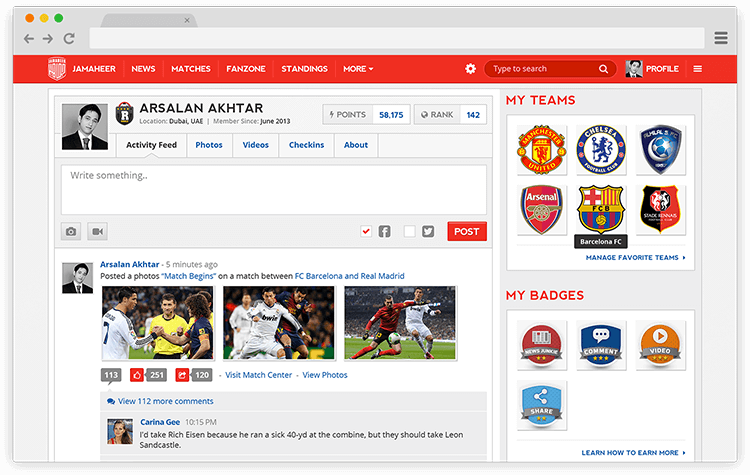 Jamaheer's back-end system is designed with the ability to gather the latest football news from multiple 3rd party APIs that have been integrated, as well as to allow for admins to upload news stories manually via an admin panel. From trade news & rumors to injury reports and more, Jamaheer's audience is always up to date on the latest happenings in the football world. Find out which teams are playing next, their schedules, the scores of completed matches, live scores of on-going ones and much more. The match center will keep you up to date with live results as they happen. 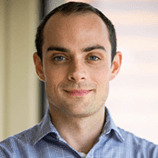 Users can filter out matches based on leagues, or time periods or share with their friends to start a debate on a match that catches their interest. 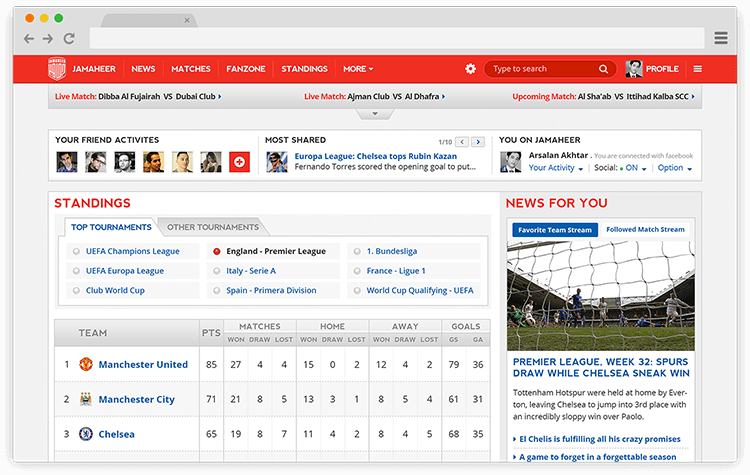 Jamaheer acts as a one-stop hub for all football related activities for fans. Find out what the fans are saying about certain matches, players, or pictures on Jamaheer. Post your own media or check out the latest postings by others. The Fan Zone is the place to interact with like minded football fans from around the globe. An aggregated feed of all the activities, predictions and more, the Fan Zone is the go-to place for football related fan engagement on Jamaheer. The most engaging part of the platform, the match predictor allows fans to predict the score of upcoming matches for points and bragging rights. This gamification element has generated a massive amount of engagement for the portal and continues to draw in fans from all over the world. Beat your friends in the predictions and share your victory on their social media feeds! 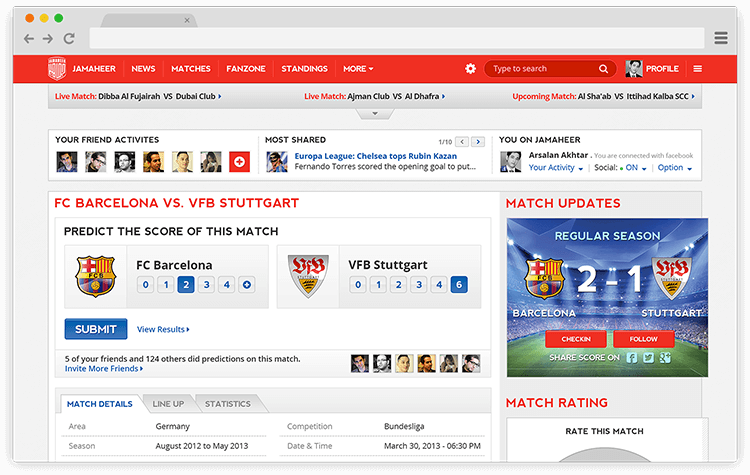 The match predictor is also a great way to hold contests and generate buzz around upcoming tournaments. Find out how your favorite team fares amongst the competition. The 3rd party APIs integrated for live scores and standings will pull in the latest information and keep everything updated for all the leagues around the world. Filters are available to view standings for particular leagues, and different tournaments around the world. Football fans are amongst the most vocal of any sport and engagement is the 'goal' of this platform. The Posts & Comments feature achieves this in spades. Users can post pictures and engage in debates on these to earn points and improve their ranking. Post, Like & Comment to foster vigorous debate amongst your friends and rivals alike. Jamaheer is the global platform to bring it all together. Jamaheer has received immense praise and is quickly gaining momentum as one of the premier football portals for the Arab world as it offers the portal in several local languages for the middle east. With a dedicated fan following and a growing user-base, Jamaheer is primed to make great strides in 2017 with several new features and a mobile app on the horizon.